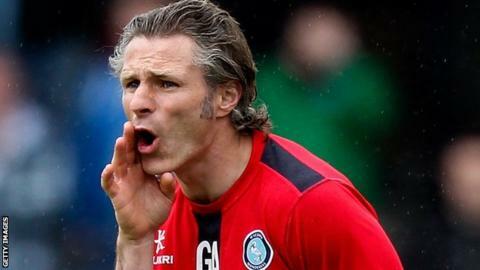 Wycombe Wanderers boss Gareth Ainsworth believes his side will defy the odds and stay in League Two at the weekend. The Chairboys need to win at Torquay on Saturday and hope either Northampton Town or Bristol Rovers lose. "The odds are stacked against us, but not as bad as they could be," Ainsworth told BBC Three Counties Radio. "I still believe in fairy tales. I read them every night to my three children and hopefully I can be telling them about the day Wycombe survived." Wycombe dropped into the League Two relegation places last week after a 2-1 loss to fellow strugglers Bristol Rovers. Northampton, meanwhile, defeated Dagenham & Redbridge, leaving Ainsworth's side are three points behind both of their rivals. But their favourable goal difference means a win at already-relegated Torquay, coupled with a defeat for Rovers at home to Mansfield or Northampton at home to Oxford, would see the Adams Park side avoid a return to the Conference Premier after 21 years in the Football League. "I believe it can happen. Positivity has been my life for 40 years," said former QPR midfielder Ainsworth. "I firmly believe that there will be a twist. We have to do our side of the bargain, so we'll go all guns blazing. "The players were distraught after the Bristol Rovers defeat, but there's no room for moping about and we've had a great week. "These lads would run through brick walls for me. There's one more wall and we need to smash it down."